Talent/Profession: Stunts. Dare Devil is a stuntpony who also works as a mailpony. Powers: None, unless you count being able to survive countless crashes and accidents. Physical Description: Dare Devil is tall, a bit skinny, but quite nimble and much more sturdier than you expect. He also has scars on his body, a reminder of past failures. His left wing is braced because of an accident during one of his stunts. Personality: Dare Devil, as the name suggests, was born without knowing fear. He does the things that others would consider a death wish. Danger is his addiction which is why he became a stunt pony. This isn't the only thing he does though, he also works as a mail pony when he's not trying to kill himself for the adrenaline rush. For him, it's a great way to balance out his frequent brushes with certain death. 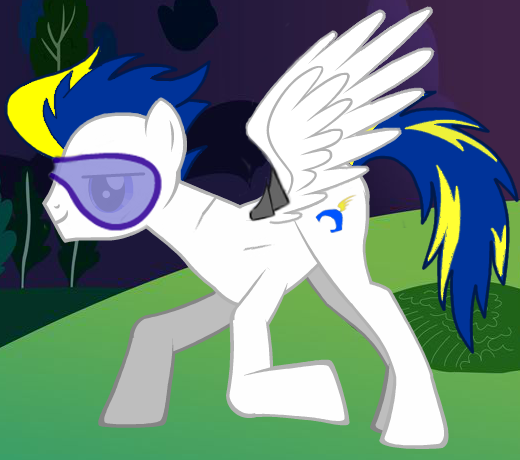 He is surprisingly gentle for somepony with that many scars, but is a bit mischievous and can be somewhat of a showoff. He just can't resist a race and can feel depressed when he's forced to decline. Though he does know when things are over his limit, he never hesitates to push himself, which lead to too many injuries for his parent's taste. He does sometimes get genuinely scared, but he is just good at hiding it. And he is never good at handling any of his relational situations. finally arrived and rescued them, they said that he was the only one who didn't cry, he just laughed like the flames were entertaining him. That's when his parents knew exactly what to name him. Throughout his life, a lot of his friends joked that when Dare Devil begins to be afraid, that's when the world would collapse. He started his stunting career at school, doing tricks that would give any teacher a heart attack. He'd been scolded for that quite a few times, but when he got his cutie mark, that's when those scoldings became encouragements. He could feel that his family didn't want him doing the things he does for his own safety, but he couldn't bring himself to stop. It was who he was, and nobody could deny that. It was during one of his shows when he was forced to stop his career. He blew the stunt and broke his wing and a couple of other bones in his body. But thanks to a few good doctors and their magic, Dare Devil fully recovered, although his left wing had to be braced. Because of that accident he was forbidden by his mother to do any more of his stunts, that's when he took a job as a mail pony, at least then he could be flying around. Whenever he had to deliver something to someplace far, he'd always sneak a few stunts during his trip. Unluckily for him though, one of his mother's friends had seen him and when he got back, he was met with another scolding. He knew she meant well, but he just couldn't deny who he was. He was always the good colt, doing whatever his parents' wanted, even taking piano class, but this was the time where he had to talk back. After a long debate with his parents, he managed to convince them to let him be who he wanted to be. Dare Devil had suggested a compromise, he'd be allowed to do his stunts, but on a lesser frequency, and of course, with a lot more precaution, and he would continue his mailcolt job, just to give his mother a rest from worry. He was happy to say the least, not only could he continue his career as a stunt pony, but he'd also get to continue the job he came to love. And after a while, his parents finally accepted that he was born for danger. Other: He's blind about relationships, or at least appears to be. He also acts a bit childish at times. Wonderful! Approved! I can't wait to see you around the Rps!